The UTV that started it all, the Yamaha Rhino. The Yamaha Rhino was first introduced in 2004 and has become one of the most popular Side by Sides to date. The Yamaha Rhino paved the way for the side by side parts and accessories market. 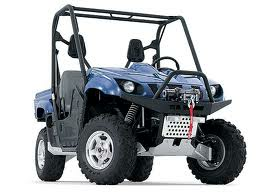 We carry all the parts and accessories for the 660 and 700 Yamaha Rhino. Here at Side By Side Sports we pride ourselves on having the largest selection around of parts and accessories for your Yamaha Rhino including exhaust systems, roofs, lights, winches, bumpers, wheels and tires, windshields, doors, mirrors, enclosures, seats and harnesses. Whatever your needs may be Side By Side Sports has the largest selection of parts and accessories available for your Yamaha Rhino.